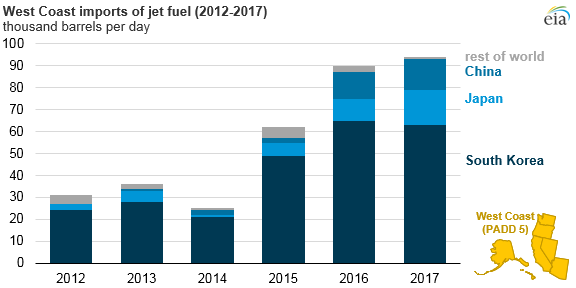 Net imports of jet fuel into the West Coast (defined as Petroleum Administration for Defense District, or PADD, 5) have increased in recent years as regional jet fuel consumption has outpaced production. States in the West Coast region—those bordering the Pacific Ocean plus Nevada and Arizona—make up about 20% of the U.S. population but account for nearly a third of U.S. jet fuel consumption. Most of these jet fuel imports have come from refineries in Asia. West Coast jet fuel consumption increased by 6% in 2016 and by another 5% in 2017, averaging 527,000 barrels per day (b/d) through December. In particular, Alaska and Hawaii have higher per capita jet fuel use because of their remote locations, using thirteen and five times the national average, respectively. Note: Alaska and Hawaii data originate from prime supplier data. U.S. and PADD 5 data originate from product supplied data. A number of factors have driven increases in jet fuel consumption since 2014. The average jet fuel price dropped to $1.53 per gallon in 2015, compared with an average price of $2.92 from 2012 to 2014, mostly because of lower crude oil prices. 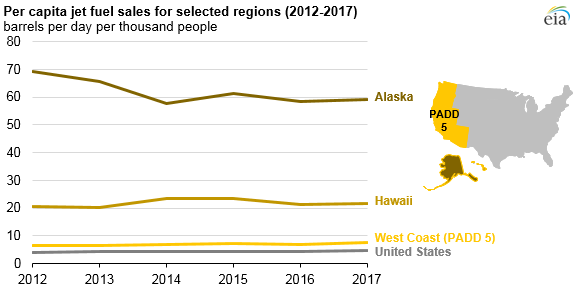 In addition to reduced jet fuel prices, economic and population growth since 2012 in the West Coast region have been higher than the U.S. average. 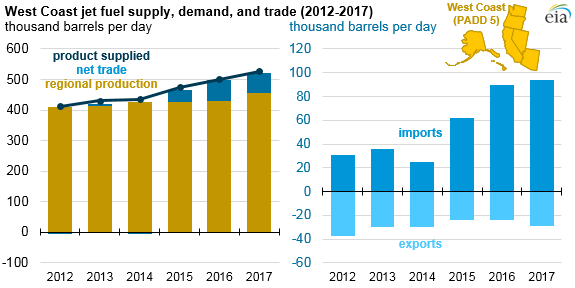 Because of the West Coast’s relative isolation from areas of production, higher imports have largely met the region’s increasing jet fuel demand. From 2012 through 2014, nearly all (98%) of the region’s jet fuel demand was met by production within West Coast states. This share fell to 87% from 2015 through 2017 as consumption increased. Increased imports of jet fuel into the West Coast created an opportunity for Asian refineries to supply jet fuel to the region. These imports came primarily from South Korea, China, and Japan. In 2016, West Coast jet fuel imports from these three countries totaled 87,000 b/d, or 96% of total jet fuel imports into the West Coast. In 2017, West Coast jet fuel imports from these countries increased again, reaching 93,000 b/d and accounting for 99% of total imports into the region.